Samstag Fähre Reservierungen möglich! Dies ist ein Samstag bis Samstag nur in den Sommermonaten. Genießen Sie Ihren Urlaub Marthas Vineyard in diesem fabelhaften (super sauber!) Cape Cod liegt in einer ruhigen, abgelegenen Familiengegend, günstig in Katama zwischen Edgartown und South Beach. Das Haus ist nur wenige Minuten von malerischen Radwegen entfernt, die zu einigen der spektakulärsten Strände der Insel führen. Es ist ein sehr angenehmer Spaziergang oder eine Radtour in die Innenstadt. Erster Stock großes Zimmer ist hell, offen und einladend. Features sind luftig hoher Decke, Holzboden und klassisch charmanten New England Dekor. Das große Zimmer verfügt über viele Fenster mit Blick auf den schönen privaten Garten und Terrasse. Die Küche ist komplett ausgestattet. Essbereich bietet bequem Platz 6 für einen schnellen Imbiss oder gemütlichen Essen. Im ersten Stock verfügt über zwei gemütliche Schlafzimmer mit jeweils einem eigenen Fenster-Klimagerät für individuelle Klimaregelung. Im Obergeschoss eine geräumige, offene Loft erwartet Sie, ideal für die Kinder oder Gäste, die einen separaten Ort zum Entspannen und Schlummer wünschen. Es gibt eine geräumige Terrasse vor dem großen Raum, ideal für Pausen zwischen den Sightseeing Touren und Mahlzeiten im Freien. Eine große umzäunte "After Beach" -Dusche steht Ihnen nach einem Tag voller Sonne und Surfen zur Erfrischung zur Verfügung. Liegestühle und Kindersandspielzeug auch für Ihren unbeschwerten Genuss der Küste zur Verfügung gestellt. Alle Annehmlichkeiten, die Ihren Urlaub unvergesslich sind in unmittelbarer Nähe in diesem herrlichen Rückzugsort am Meer. Schöne Sonnenuntergänge, unberührte Strände, erstklassige Restaurants, Boutiquen, Bootfahren, Radfahren, Angeln, nennen Sie es, alle in der Nähe. Waschmaschine und Trockner für Ihre Wäsche Bedürfnisse. Sie können die Vermietung von Bettwäsche auch über einen lokalen Service arrangieren. Bitte beachten Sie, dass wir eine separate Garage / Studio-Apartment auf dem Gelände haben, die möglicherweise von einem Familienmitglied bewohnt wird. We recently spent a week at this cozy cute private Edgartown property. The location worked extremely well. It was nestled in a quiet & beautiful neighborhood setting within just a mile+ of downtown Edgarton and was a perfect spot. We had three grand children, ages 12, 14, 16, with us and enjoyed riding bikes in and around the area. Everything else was within a short drive. The home was comfortable and well appointed, including a kitchen filled with everything needed, and then some, for home meals. In spite of some rainy weather, we had a wonderful time. The owner was wonderful to deal with from beginning to end and extremely responsive. 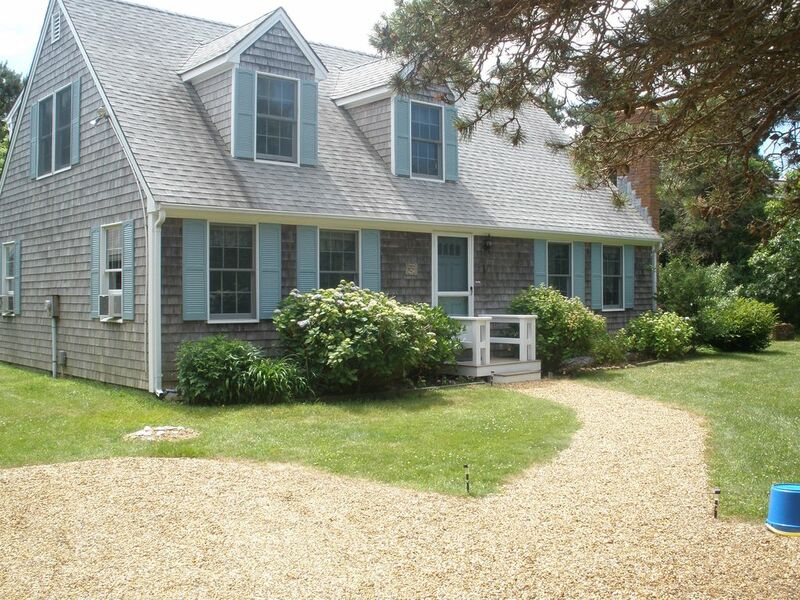 I would highly recommend this property for your stay on charming Martha’s Vineyard. It was our first time to the island and this home but not our last. Can’t wait to return! Thank you for taking the time to write a review. We enjoyed having you as our guests and hope to have you back next summer. Maybe next year the weather will be better! Cute and very cozy cottage in a private location. The location of the home is fantastic! It is close to town and the beach! We enjoyed walking into town and biking to the beaches. The house has two cute bedrooms on the first floor and our kids loved the upstairs loft. The spacious outside shower is heavenly after a day at the beach. The large secluded deck is lovely for outside cocktails and dining. Our children enjoyed making s'mores over the new fire pit. Jackie (homeowner) was great to deal with and offered many island suggestions for dinner and outings. We are planning a return trip next summer. This home was in an ideal location close to town and the beaches. It was great being able to walk into town and avoid the need to find parking in town. We enjoyed the al fresco dining on the very private deck and our time around the fire pit. The house was very clean and beds were comfortable! Our kids enjoyed the loft tremendously! Fun atmosphere up there for them to sleep and play games. This was the best stoked kitchen of any rental we have ever had! Homeowner was very easy to work with. Hope to be back soon! Lovely place with everything you could possibly need! Our family had a wonderful week on the Vineyard. The house was very clean and had everything we needed. The location was great and it was a short car ride to South Beach or into Edgartown. We enjoyed biking to Morning Glory Farm which is very close, and through Katama around the beach area. The outdoor shower was fantastic after a beach day, a well as to hang on the porch. Jackie was fabulous to work with and very flexible and accomodating to what our family needed. Great place to stay! Thank you for taking the time to review our home. Hope to have you back next summer. I stayed at this lovely home with my husband and two children during the week of July 4th. The owner was attentive, responsive and detail oriented; communication with her was a breeze. The home is in a pleasant, quiet neighborhood in Edgartown. While it is walking distance to town, it's rather a long walk, so we did occasionally drive. Overall we enjoyed our stay and would certainly come back again - the home was stocked with essential amenities and comfortable beds. The loft area, while fun for children, is open to the downstairs lights and noise, so children who need to go to bed early are better suited to the downstairs bedrooms. Thank you for your input . Our home is located about 1.25 miles to down town Edgartown. For toddlers, this might be too far to walk but, for the average person it is a lovely walk or bike ride. The bedroom upstairs is an open loft. We hope to have you back for a future vacation. This is a Saturday to Saturday rental in the summer months. One Dog per vacation considered.